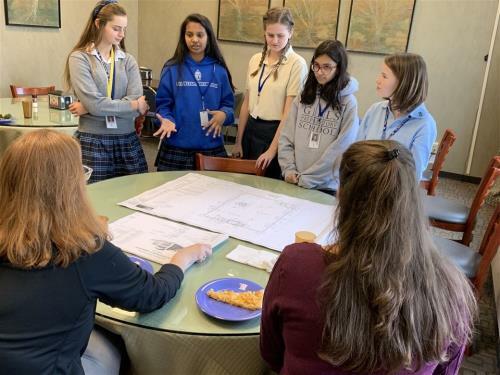 GPS alumnae Rebecca Brooks ’01 and Heather Adcox ’96 dined with GPS Middle and Upper School students to share about their experiences in the engineering and architecture fields and to discuss the relationship between the two professions as part of the Women in STEM Lunchtime Learning series. GPS STEM Coordinator Jill Pala Pieritz '97 facilitated the exchange. Ms. Brooks, a civil/structural engineer with Woods Engineering, and Ms. Adcox, an architect with River Street Architecture, often work close together—quite literally. The two firms share a building downtown and have collaborated together on a number of projects around Chattanooga, including a new medical building at 901 Riverfront Parkway in the heart of the city’s business district. During lunch, students inquired about the two job professions, asking how they differed and collaborated. “She gives me a building and I decide how to stand it up, complete all the calculations to determine how it stays structurally sound,” Ms. Brooks said, to explain the relationship between her job as a structural engineer and Ms. Adcox’s job as the architect. The structural engineer, however, is not the only engineer typically involved in a project as it is common for an architect to consult about seven different types of engineers in every project, including electrical, mechanical, geotechnical, plumbing, and fire-safety. Ms. Adcox adds that architecture focuses on the design for the structure. “But you have to make sure what you’re designing is practical and—most importantly—safe,” Ms. Adcox said. As an architect, she likes the creative aspect that her vocation demands while Brooks enjoys the predictability necessary in structural engineering. “I like knowns and things that are defined,” Ms. Brooks said. “With structural engineering, there is definitely a beginning and an end with one solution, and that is what I like that about it.” Other iconic Chattanooga structures that Ms. Brooks has contributed to include High Point Climbing Gym and The Flying Squirrel. 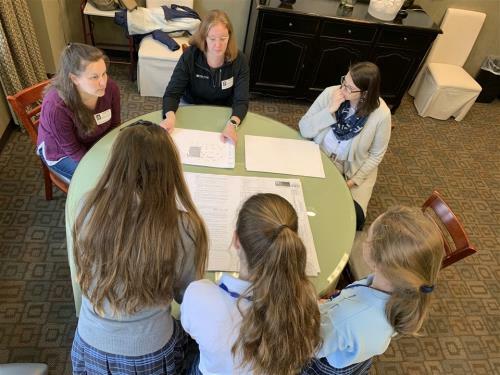 Lunchtime Learning provides meaningful connections between students and professionals in our community, typically GPS alumnae. Through these sessions, students engage with women who represent a future career interest and learn more about the day-to-day work as well as the education, training, and licensing requirements for the profession.